Pol Medina Jr.’s “Pugad Baboy” (lit. “Pig’s Nest”) is one of the most successful comic strips in the Philippines in terms of revenue and influence. The series started in one of the country’s established daily broadsheets, the Philippine Daily Inquirer, on May 18, 1988. It gained enough popularity to warrant a successful line of merchandise, yearly compilations, full-sized comic book spin-offs, and even a star-studded live action TV series (which, unfortunately, failed to see commercial success). a. The Sungcals – a family that represents the stereotypical Filipino family, consisting of a housewife, a working husband, an intelligent gradeschool student, a vain sister, and a brother working overseas (“sungkal” is the Tagalog term used to describe a pig’s act of digging a hole using its snout). The family also includes the talking dog Polgas, whose name is a play on the Tagalog word for “flea(pulgas)” in combination with the author’s name. b. The Sabaybunots – a well-meaning, but otherwise chaotic army family consisting of a triggerhappy, philandering soldier, his overbearing and temperamental wife, and a mischievous kid. The family name is loosely based on the Tagalog phrase for unholstering a gun quickly. c. The Tangeres – a family consisting of a communist rebel and his son, with the mother mostly away on missions as a revolutionary fighter. e. The Tangs – a Chinese small business proprietor, his gay son, and lesbian daughter. While there was initially public controversy over the political correctness of the series, “Pugad Baboy” is generally absolved from criticism in this regard for a number of reasons. First is the fact that the people who live in “Pugad Baboy”, save for a handful of characters, are all members of what is best described as the overweight elite. The characters are never marginalized or ostracized because they are part of the Philippines’ ruling class. In many of the situations depicted in the series, these flaws empower the characters. In one of the more memorable story arcs, the “Pugad Baboy” citizens successfully sought revenge upon a rude and manipulative restaurant owner by visiting his establishment during an “Eat All You Can” promotion, thereby eating his business into bankruptcy. Additionally, even though there are strips that do make fun of the “Pugad Baboy” denizens’ weight or appetite, they are very rare exceptions and not the rule (and obviously, such an approach would not be enough to sustain a comic strip for more than three decades). Instead, the author, Pol Medina Jr., targets Filipino culture and current events, particularly politics and show-business (which are intimately intertwined in the Philippines). There is some finesse in articulating the distinction between a joke about a fat person, and a joke made by a fat person. The patriarchs of the Sabaybunots and the Tangeres also add flavor to the strip (these storylines are always the funniest and most politically-relevant). These characters are mortal enemies by profession, but are drinking buddies and the closest of friends outside of work. This is the first time we have reviewed a comic strip: we have otherwise always reviewed comic books. 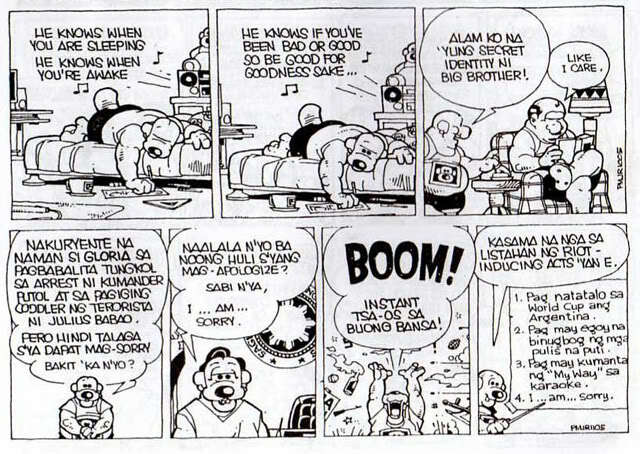 But in terms of format, “Pugad Baboy” meticulously treads the line that separates continuity strips from gag-a-day strips. Mr Medina Jr. alternates between releasing standalone strips that function independently of each other, and multiple strips with ongoing plots or a single unifying theme. Regardless of which plot sub-format, for want of a better term, is used, each daily strip contains a stand-alone joke that allows any reader to jump in without feeling lost and a need to backread. The choice of format lends itself well to trade paperback compilations, even though it was not the original intention. In fact, the first compilation in 1989 was not a commercial release, but a limited print run published by a student named Frank Aldana for a college thesis. The original print run consisted only of 800 copies and was sold out in three weeks. It is the Holy Grail for “Pugad Baboy” fans especially since the re-release done years later contained massive changes designed to improve consistency and readability. The comic strip itself would be a great start for someone who wishes to study modern Filipino humor or someone who wants to get a frank and honest look at how contemporary Philippine society sees itself, using satire and parody as a filter. There is a need to read and understand Tagalog first, as there are no English translations of the strips. And there may never be one, because humor of this type, the language-dependent jokes used copiously by the strip, rarely survive translation.